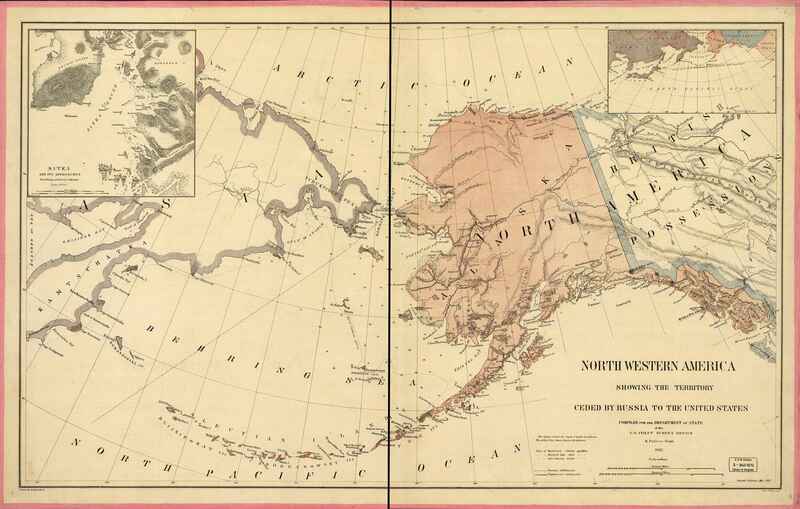 Alaska in 1867- photo credit attached to lesson plan. 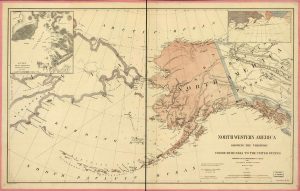 Students will investigate the forced relocation of peoples from the Aleutian Islands to Southeast Alaska during World War 2. This lesson will fit within a larger unit of WWII or an Alaska History class- deepening awareness of the history of movement of people and present day movements of people. Migration, globalization, war, subsistence lifestyle, civil rights and social justice issues are amongst the many lessons that in a larger unit can be obtained. A key piece of the lesson is looking at the impact of WWII on the people of the Aleutians- being forced to leave their homes and live in internment camps for some years in Southeast Alaska. And then upon their return home, what had changed and how that change has impacted the peoples of the Aleutians. This lesson looks at how a culture is impacted by an external force.. and how that force has changed the culture. Some of the lesson is student research based– looking at books and reading online written materials. Some of the lesson is listening to Elder stories, both recorded and in person. The assessment of knowledge gained comes in the form of both sharing (both written and orally) with the class ‘things learned’ from the written materials as well as ‘things learned’ from the oral tradition. At the very beginning of this lesson, we look at gapminder.org, to see trends of years and places around the world where populations have changed. We also create a word wall of ‘why people move’- on a global scale. But this lesson also looks inward and utilizes students’ local knowledge. A key piece of this lesson is the creation of maps by the students. For this activity, they are to look at change/movement in their own lives as well as that of their ancestors and communities. In this way, we are connecting local to global. 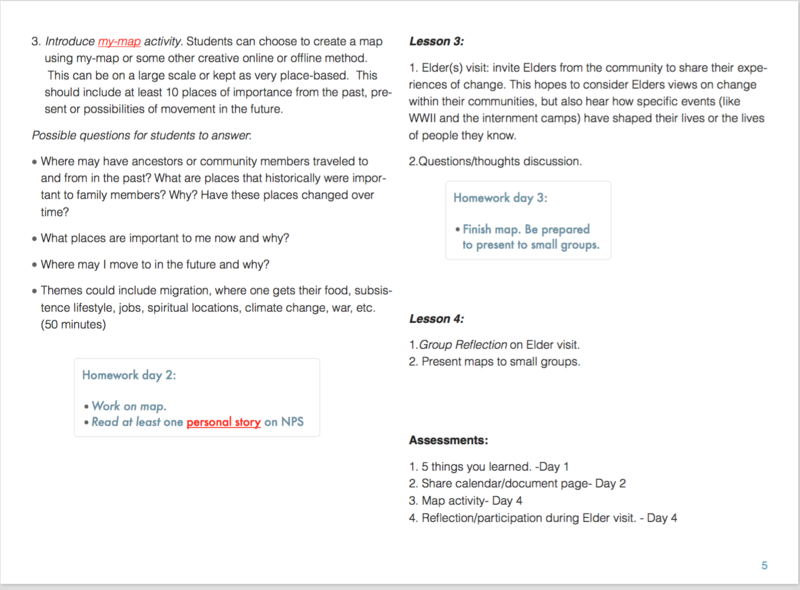 I look forward to looking at other student lesson plans and then adapting mine for use in the future. Those are some great standards; I like how your lesson hits all of those. I really love how you have multiple lessons. It enables you to use this project for more than a day and possibly save you time from going through lesson plans every single day. Topic itself will certainly keep students motivated to learn about this issue. I don’t think anyone can imagine what it feels like to get forcefully relocated to an unknown world. You’ve put a lot of work in your unit. I like that you are using gapminder.org, videos, and fun activities that will keep students engaged in your lesson. Great job! I like the way the global conflict of WW2 can be related to Alaska, and down to the local level. I think students are much more interested in these things when they can see where they happened. I like how interactive your lesson plans are. You have your students doing a lot of different activities, looking at the same questions from many different angles. They have the practical logistics and the historical context, and the very real human side of this issue. Great Job! Nicely done. In the melee that was our recent project I had totally lost site of where you were going with this lesson. It turned out great, looks like it would be a fun set of activities and it would get the message across to the students. I think the utilization of tools we’ve recently learned to use will also enhance the student’s interest and their learning. I’m impressed to see you used the gapfinder and maps apps! I remember being interested when Peter showed us these and I want to emulate how you incorporated them. I think it’s awesome that you’re using gapminder. This project seems like it would be really interesting for the students – there’s such a variety of sources and activities. I like the essential question too. Phrasing it as “why do we move” seems like it should hopefully get the students making connections between themselves and the historical events they’re learning about. I echo Matt’s comments, this turned out amazing. It is deep and thoughtful and uses great resources. It can segway into so many different realms, i.e. migration patterns due to climate change, modern day wars, etc. Really great work Erin!